”I guess we got a little stagnant and they started making plays. It happens,” Teague said. Minnesota shot just 26.9 percent and was outscored 34-22 in the final period in Monday’s 118-106 loss in Charlotte. One night earlier, Minnesota allowed an 11-point lead to slip away in the final quarter of a 100-97 home loss to Detroit. ”They were able to get to their spots; they were able to get to the line. We just made it too easy for them coming out of half. They just took the momentum and it carried them over to a win,” Gordon said. Magic: Elfrid Payton had a season-high 13 assists. . Vogel is optimistic that F Jonathan Isaac (sprained right ankle) will return on the current four-game road trip that ends Monday. Isaac, the team’s first-round pick this year, has missed five straight games. 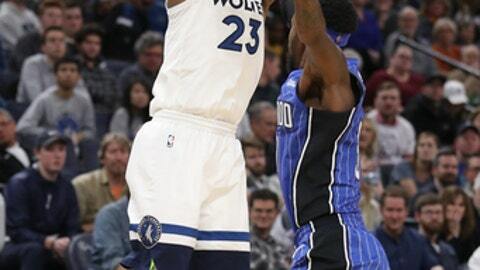 … Orlando had just four fast-break points. Timberwolves: Minnesota begins a stretch of playing 10 of 14 games at home, where it is 6-2. … G Jamal Crawford finished with nine points playing his 1,200th career game. … Thibodeau said rookie C Justin Patton, out all season with a left foot injury, is going through non-contact drills and is close to a return. Minnesota’s bench combined for 14 points on 3-for-20 shooting in just over 49 minutes. Gordon, the league’s top 3-point shooter a couple weeks ago, was 2 of 8 and has made just nine of his last 39 attempts from beyond the arc.